According to this report, the British Commons is soon to begin an emergency 3-hour debate with them stating beforehand that Western air forces must be willing to confront Russian military jets over the skies of Syria to enforce a no-fly zone and protect the citizens of eastern Aleppo—and that is being led by British lawmaker Andrew Mitchell who just hours ago outlandishly likened Russia’s behavior in Syria to that of Nazis. With the threat of war between the Federation and the West now said to be “more dangerous” than the Cold War, this report continues, these British lawmakers, like their Obama regime counterparts, have begun propagandizing their own citizens as to the true nature of this conflict—and is most simply stated as Russian military forces aiding the Syrian Arab Army in its freeing the peoples of Aleppo (Syria) from the barbaric Islamic State (ISIS/ISIL/Daesh) terror they’ve been forced to live under the past 3 years. MoD spokesman Major General Igor Konashenkov in this report countered these British lies forcefully by stating: “Before launching into incoherent conjecture about Russia’s supposed responsibility for the situation in Aleppo in particular, and Syria in general, it is necessary to think – what has the UK contributed to this poor country? Where was the UK when ISIS nearly reached the Mediterranean coast, almost turning Syria into a terrorist caliphate, like Libya. After all, it was you who controlled the skies at the time”. Major General Konashenkov then asked if it is, perhaps, Britain that “should be held responsible for the birth and nurture of ISIS, and Al-Qaeda affiliate Al-Nusra Front, which is now being effectively subdued by the Russian air forces”, but to which the British have yet to reply. And just hours ago, this report notes, these Obama regime and British backed Islamic terrorists launched yet another deadly terror attack on the innocent civilians of Aleppo who had been freed from their barbaric rule by Syrian Arab Army forces and their allies, under cover of Russian warplanes, and who continue to destroy these barbarians—while at the same time China, Azerbaijan, Serbia, India and Kazakhstan have now joined Russia’s efforts to rush much needed humanitarian aid to the civilians affected by this needless American and British backed war. This report further notes that Foreign Minister Sergei Lavrov has previously warned the Obama regime against attacking Russian forces in Syria, and who bluntly told them: “This is a very dangerous game given that Russia, being in Syria at the invitation of the legitimate government of this country and having two bases there, has got air defense systems there to protect its assets”. Most astounding to read in this report, though, is its revealing that President Putin’s long assertion that Obama regime allies Saudi Arabia and Qatar were secretly funding these Islamic State terrorists was confirmed as being true yesterday after a secret Hillary Clinton email released by Wikileaks shows she had knowledge of this fact, but kept it secret from the American people, and the entire world. 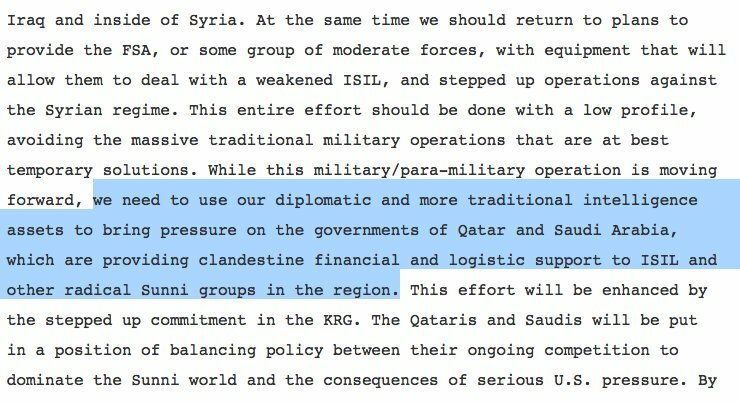 Hillary Clinton secret email confirming Saudi Arabia and Qatar funding of Islamic State terrorists—click HERE to see original. As to why Hillary Clinton kept the American people from knowing that Obama regime allies Saudi Arabia and Qatar were funding the very Islamic State terrorists who were destroying the Middle East, and that the US was supposed to be fighting, this report shockingly details, was due to both of these nations having paid her $55.8 million to keep silent. With President Putin just hours ago suddenly cancelling his planned to trip to France after that nation joined the Western propaganda blitz against Russia accusing the Federation of war crimes for daring to kill the Obama regimes Islamic terrorists, this report states, the only leader left to stop World War III is Donald Trump—who yesterday in a “debate” with Hillary Clinton again stated that he would seek Russia’s help to defeat ISIS—and who have just begun attacks in Algeria for the first time. And as these Islamic terrorists have added to their list of atrocities this past week by stoning a woman to death for her refusing to marry one of their fighters, and their destroying the ancient Assyrian Church in Iraq’s Nineveh, this report continues, the American elites fear that Donald Trump is close to winning the US presidential election (and with his doing so would forever doom these barbarians) and have caused them to launch an unprecedented attack against him. Leading the attacks against Donald Trump, this report explains, are US intelligence agencies who are backing Hillary Clinton and are supported by at least 3 powerful media organizations who have ordered all of their employee’s to destroy Trump, along with every major propaganda mainstream newspaper in the United States who are backing Clinton too. 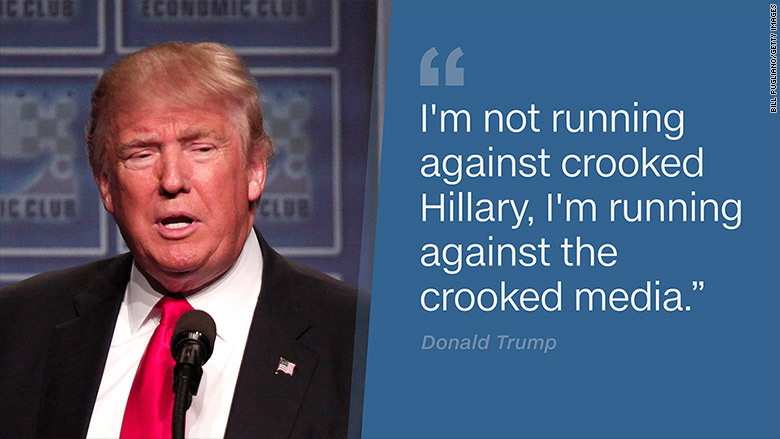 And as to why Donald Trump has to be destroyed, MoD analysts in this report explain, is due to Hillary Clinton’s fear that he is awakening the American people to what has been done to them by their monstrous elite rulers—but that stands opposed to her agenda outlined by one her top advisors, Bill Ivey, in another secretly released email wherein he shockingly admitted “the need to maintain political power by producing an unaware and compliant citizenry”. This report concludes by noting that a recent answer given by Université de Montréal Professor of History Michael Carley to young Russian students who asked him why the West hated Russia so much is now equally applicable to the American people too, and who warned that “the answer is not complicated… you cannot cross “da man” in the United States, that is, the powerful, wealthy US “deep state” which sets the rules for everyone else and enforces its worldwide hegemony against disobedient states and leaders”—and that most certainly describes Donald Trump and all who support him.